Adventure Park Saar’s high ropes course is an all round leisure experience! 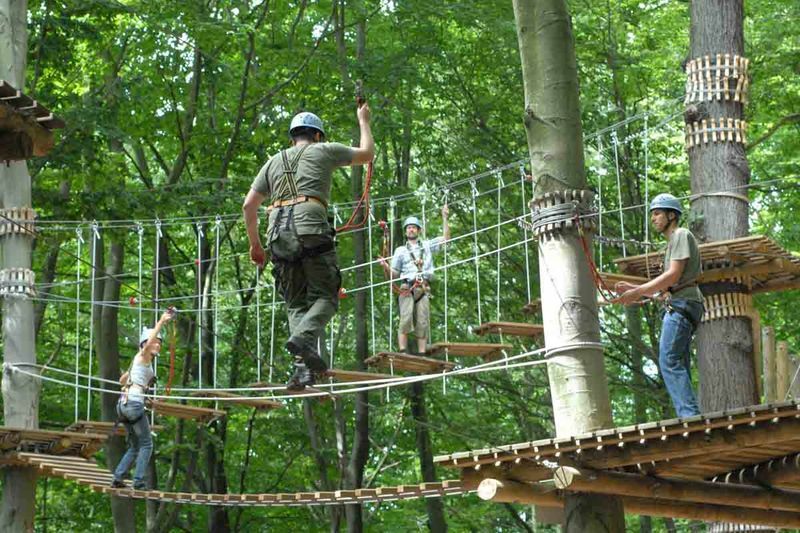 This high ropes course is located right in the middle of Saarbrücken’s municipal forest. There are altogether seven sections at a height of three to twelve metres, with many different obstacles and exercises to complete. The course below the treetops leads over wire ropes, swings, ropeways and boardwalks, enabling visitors to experience nature from a different perspective. The high ropes course’s obstacles and challenges will boost your self-confidence, and everyone from the age of twelve and with a height of at least 1,45 m can take part. Families, groups and individuals are very welcome to join in and experience Saarbrücken‘s high ropes course!